Former President of the National Democratic Party of Tibet, Mr Youngdung is introducing his new project “Tibetan Social Service” to Tibetan supporters in Europe. 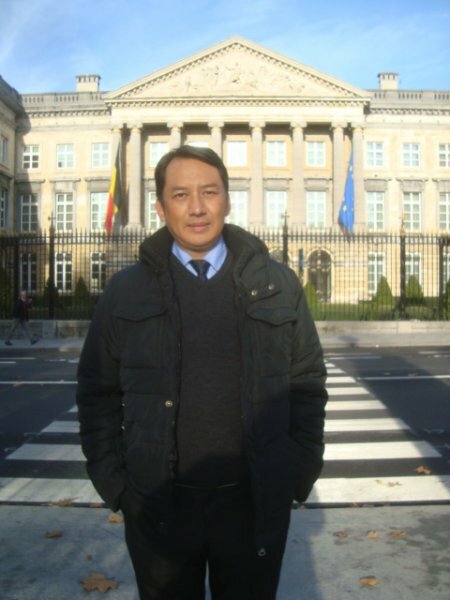 Mr. Chime Youngdung, currently Director of Tibetan Social Service (TSS) with its main office in Dharamsala (India), has started his European tour with a 5-day visit to Belgium. Mr. Youngdung is the former President of the National Democratic Party of Tibet. He arrived to Europe with the aim to raise further awareness about Tibet and the Tibetan cause and to introduce his new initiative, the non-profit organization Tibetan Social Service to the European friends of Tibet. As a successful political campaigner for his community and a knowledgeable promoter of freedom and of empowerment for Tibetans, he was warmly welcomed by many friends, political representatives as well as the local people in Belgium. Arriving to Brussels airport on the morning of November 17th , Mr. Youngdung was greeted by International Board Members of TSS in Belgium: Mr. Dennis Barbion, President of the Tibetaanse-Vlaamse Vriendenkring (Tibetan-Flemish Circle of Friends) and Mr. Han Vandenabeele and his partner Liesbeth Van der Haegen, Board Members of Vrienden van Tibet (Friends of Tibet for the Dutch part of Belgium). They prepared a tight, though a very interesting schedule for the TSS Director, consisting of meetings with the Tibetan community in Belgium, with Mr. Jan Peumans (Chairman of the Flemish Parliament), with the UNPO Program Manager Mrs. Maud Vanwallegem and the Tibet Support Groups and Tibet supporters in Belgium. In between the busy schedule, they also included some interesting leisure activities and historical visits in various Belgian cities. On his first day, following a short rest after the long flight, Mr. Youngdung gave a public lecture in the city of Brugge, Flanders (Northern part of Belgium), where a mixed nationality audience was eagerly listening to his presentation about Mainpat where he was born, the Tibetan settlement to the South of Varanasi near Ambikapur. The lecture was co-chaired by Mr. Dennis Barbion, President of the Tibetan-Flemish Circle of Friends, who translated the English lecture into Flemish for the local audience and enriched Mr. Youngdung’s presentation with his own comments and impressions from his visit in Mainpat. Listening to the difficult, but truly inspiring life story of Mr. Youngdung, along with his presentation about the conditions in Mainpat raised mixed feelings in the hearts and minds of the 30 listeners. On the second day, the TSS Director had a meeting with the representatives of the Tibetan Community in Belgium in the city of Antwerp. Following this meeting, he had the opportunity to give a speech to about 200 Tibetans in the dharma centre in Schoten. During the talks he presented the mission of TSS and explained in details the aims and objectives of the organization. The public reacted in an enthusiastic way and expressed their support for this initiative. After a day of resting and sightseeing in the historical city of Ghent, several important meetings were on the program of the 4th day of his stay in Belgium. It started with a morning meeting with the Unrepresented Nations and Peoples Organization (UNPO) in Brussels, where Mr. Youngdung was welcomed by the Program Manager Mrs. Maud Vanwalleghem. The UNPO was founded in 1991 at the Peace Palace in The Hague in The Netherlands. The members are composed of indigenous peoples, minority groups and occupied and unrecognized territories. The Tibetan government in exile was one of the founding members of the organization. During one hour and a half, the Director presented the TSS and its activities to the UNPO representative who was very interested in the organization’s vision, aims and its future work. Seen the common interests in numerous issues like in the question of leadership training, the UNPO and the TSS expressed their wish to work together in the future.